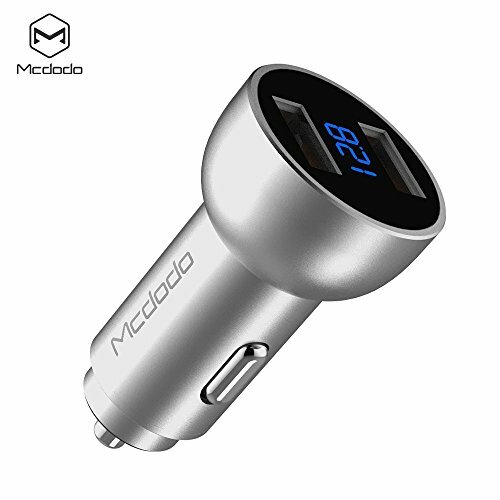 - Brand New - Color: Black, Blue, Red, Silver - DUAL USB CAR CHARGER :Combined 3.1 amps; use smart technology to ensure each device pulls the right amperage. Powered by the vehicle's cigarette lighter. - BATTERY VOLTAGE AND CURRENT DISPLAY : Display the voltage of Car battery while no charging.Let you always keep battery state of health and peace of mind when drive. -CURRENT DISPLAY,OVER-CHARGE PROTECTION: Display the current detected by the Intelligent circuitry while charging.Intelligent circuit design protects against short circuiting, over-heating, over-currents, and over-charging. -FASHION AND CUTE ALUMINUM ALLOY RING: Metal sleeve ring,piano lacquer plug. -COMPACT DESIGN FOR ADDED PORTABILITYSize = Egg.Input: DC 12V - 24V, Output: DC 5V/3.1A.One Year Warranty. How to use it : 1.Plus this car charging into car cigarette lighter hole, it will detects the car battery voltage automatically and shows on the screen, please kindly noted. For 12V car, when the voltage is under 11.5V or higher than 14.9V, the dispaly while shinning to remind your car with battery issue. For 24V car, when the voltage is under 23.1V or higher than 27.3V, the dispaly while shinning to remind your car with battery issue. If car battery has some voltage problem as the smart car charger detected, Please find professional car care shop to examine car battery to make sure it works well. 2.Connect your device to the car USB port charger by suitable cable, the screen of car charger will shows charging voltage 5V and then shows the charging current (3.1A is max current for this item). 3.The input current will decrease until your devices battery is full, then the display will switch back to voltage display. Compatible for:Apple iphone 4/4s,5/5s/5c,6/6 plus,6s/6s plus,7/7plus,ipod,ipad,Samsung / LG/ HTC . Most of phone and tablet Package: 1 x Dual USB Car Charger with LED Display. 1 x Manual.